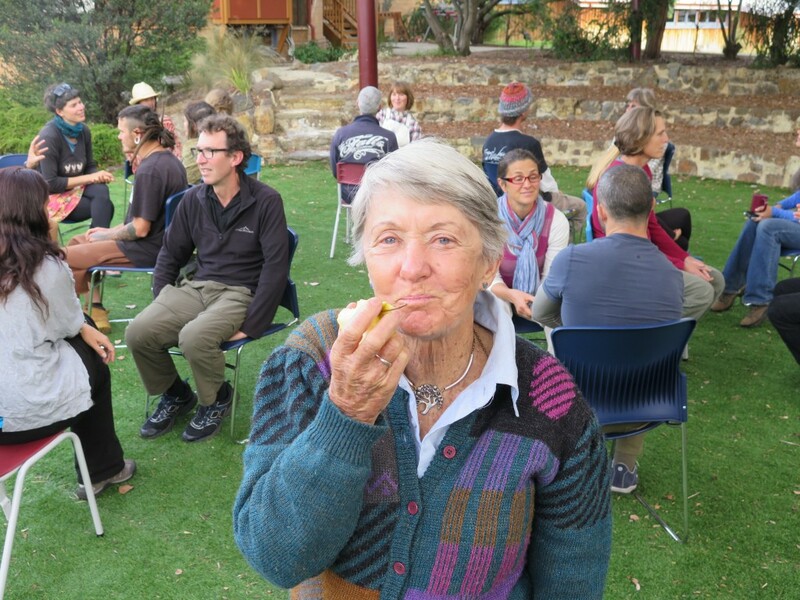 Rowe, eating yet another apple (it’s apple season right now and we’re happily drowning in them), whilst facilitating group work. 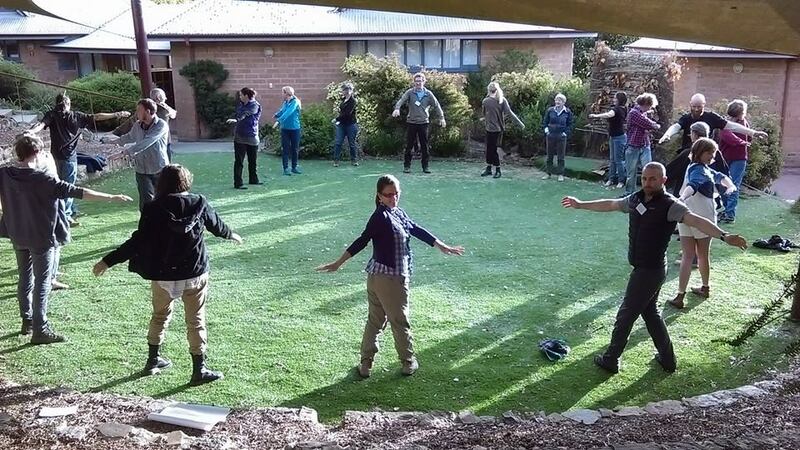 Morning time looked something like this each day – a gathering to get our body and minds moving and ready for full days. 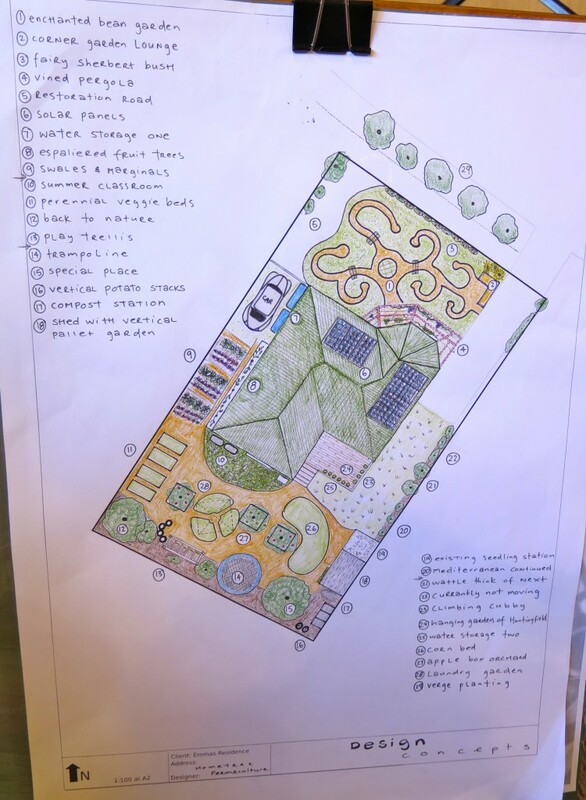 Like all of our PDCs, we focus on how to design (as opposed to how to build gardens etc). 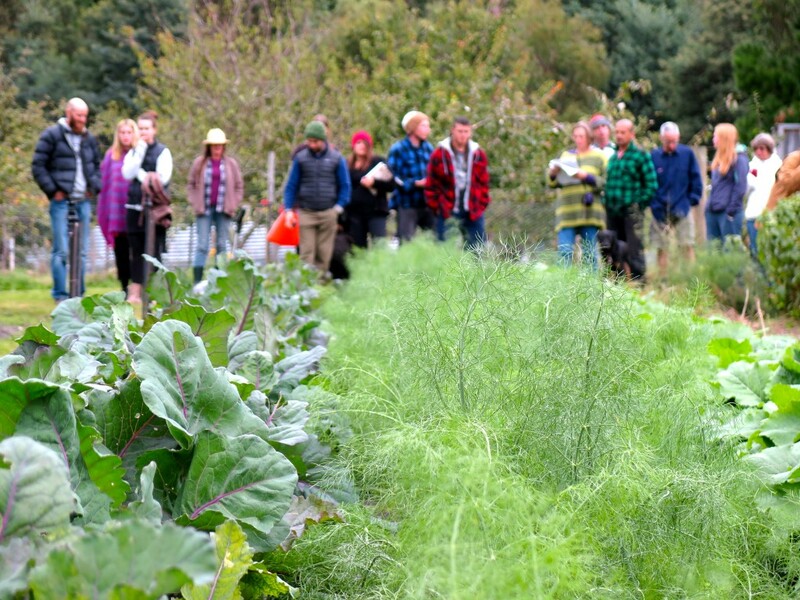 We dive deeply into the permaculture design framework and how to read landscapes effectively and accurately. 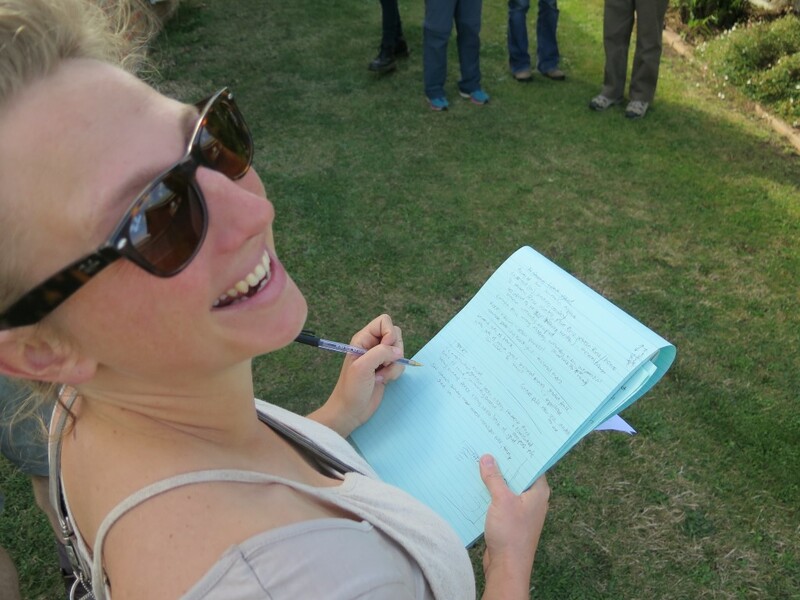 Here’s Tanya, doing her thing, analysing a site for her group design project, which went on to develop like this…. A sector analysis – part of the main design project for the course. 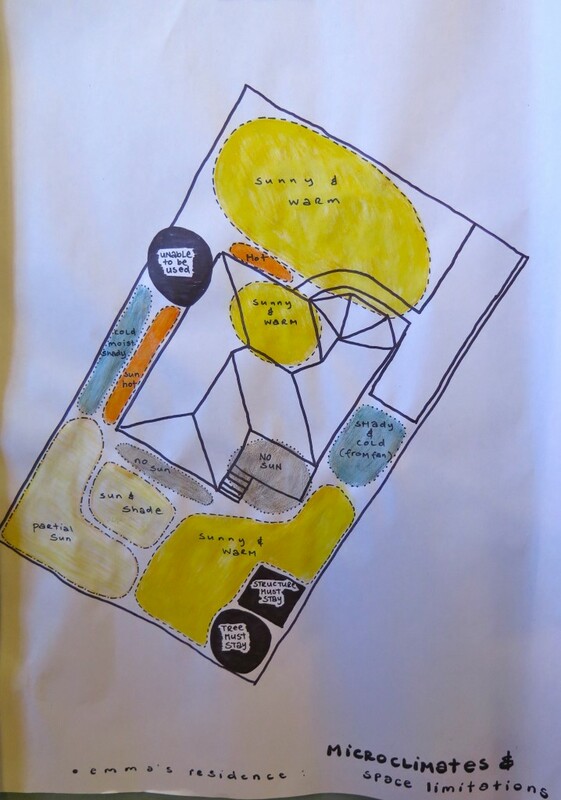 While we focus 98% of our time on design theory, we do make time to get our hands dirty implementing some strategies – in this case a no-dig keyhole garden (and compost pile out of site). 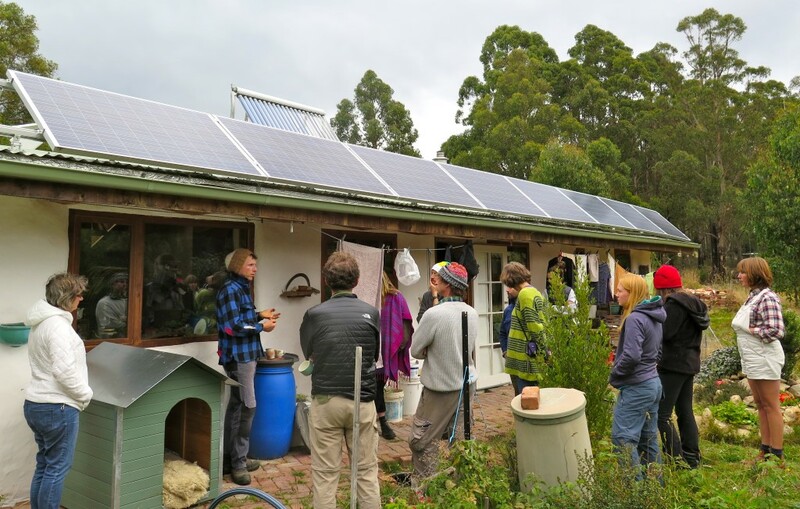 Plus we had a day of fieldtrips, where we took students on a jam-packed tour to see permaculture in action on a range of scales. 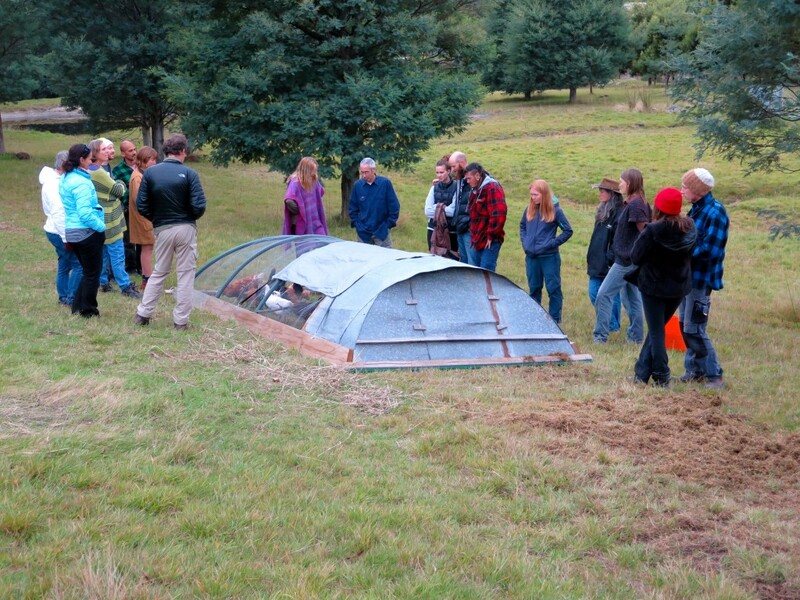 Fat Carrot Farm (in Kettering) showing students their chicken tractor – Joel Salatin style, and their exquisite market garden below. 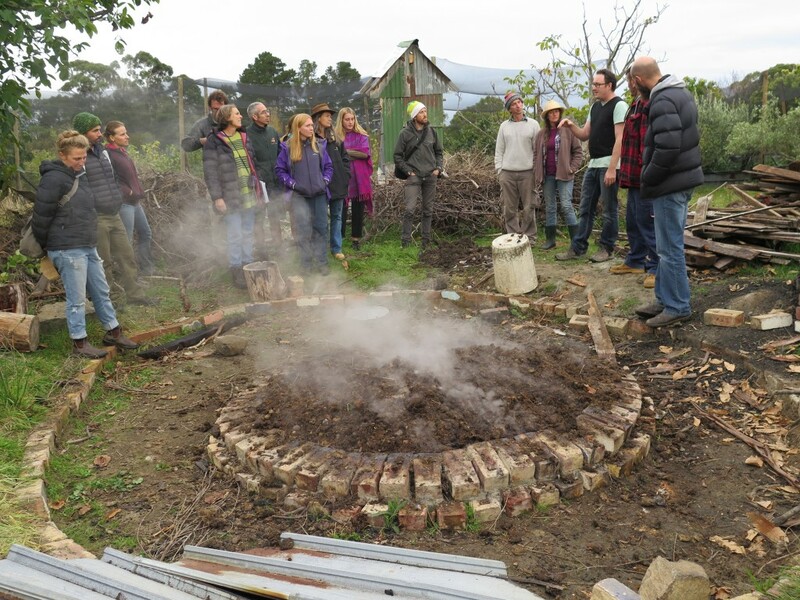 Mike from Plumplot explains their dome kiln which they make their biochar in – so clever, so beautiful. 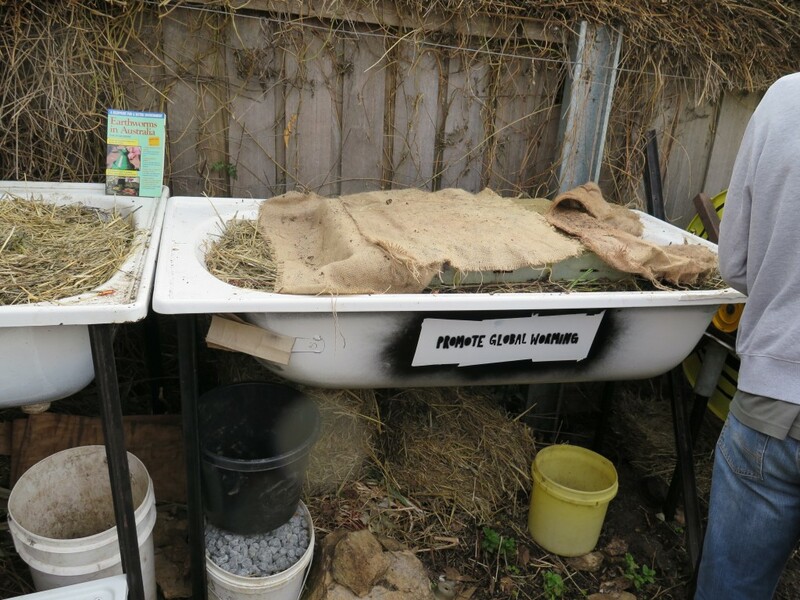 Cara and Fin delighted us with their space efficiency and numerous worm farms in a tiny urban garden. 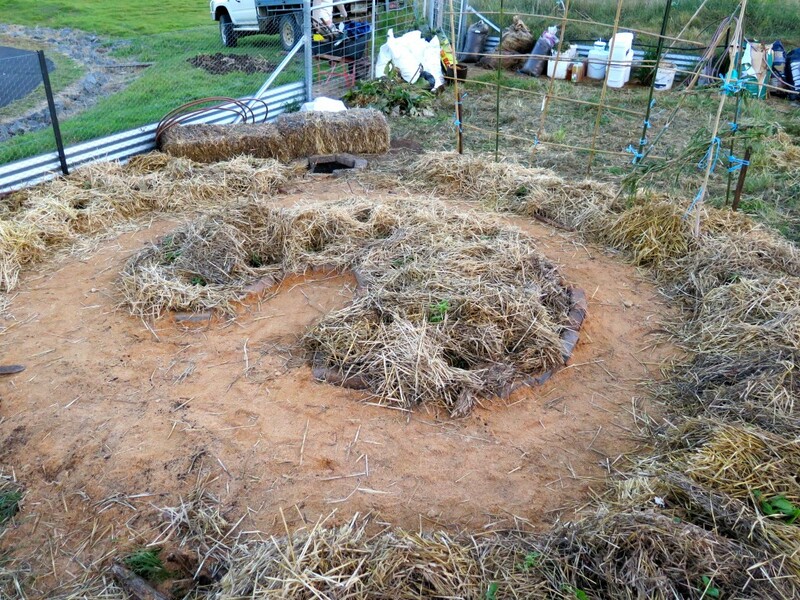 And Blake showed off his strawbale house he built himself, complete with solar energy, compost loo and grey water system. 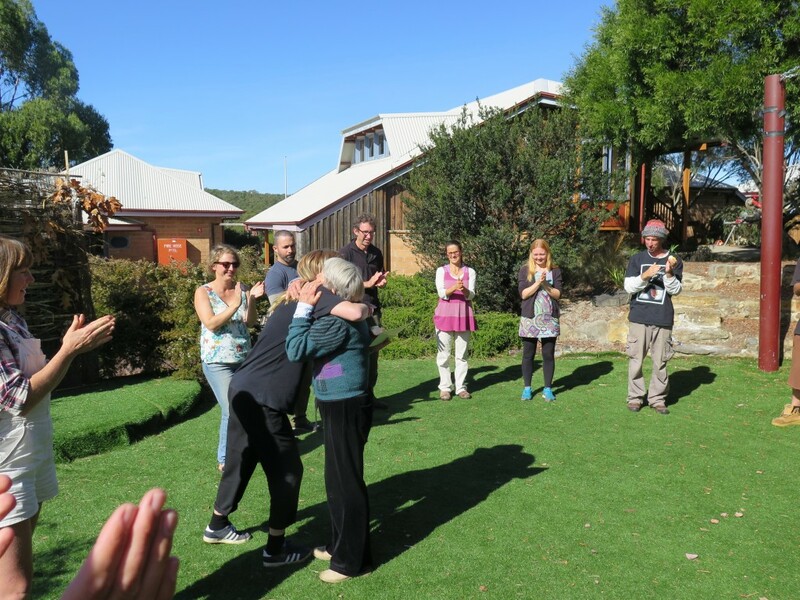 This course was full of ‘moments’, special ones, where we got to witness students have light bulb learnings and people from crazy diverse backgrounds connecting deeply with one another. We feel so honoured to be part of it all in our own small way – we know how lucky we are. One of those moments I was just talking about. Here’s Rowe delivering her grand niece, Avalon ( a student on the course) her PDC certificate at the end of the course. How amazing is that! Everyone. Thanks guys, you were and are a unique bunch of people FULL of goodness. 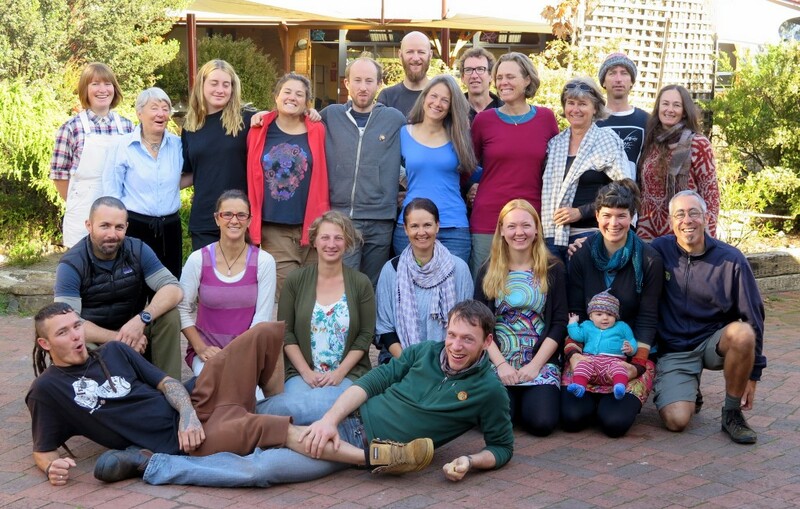 We look forward to working alongside you as permacultualists well into the future to help make this world of ours nothing short of awesome. The team. 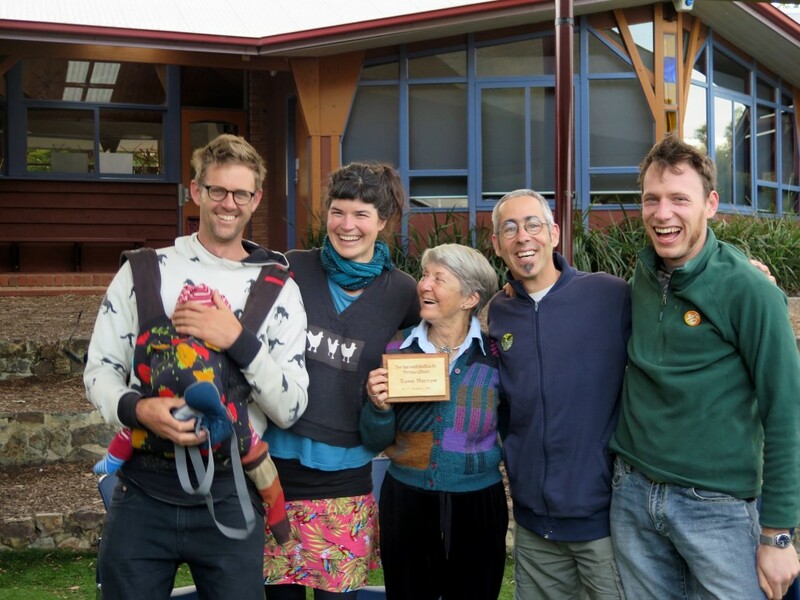 Anton, baby Frida, me (Hannah), Rowe Morrow (with a special plaque acknowledging her work in permaculture), Nick Towle and Blake Harder. Thanks to Nick and Rowe for doing the vast bulk of teaching and for doing it beautifully and to Blake for being the raddest course coordinator ever. Having this crew on board allowed us to hang in the background, do a light smattering of teaching, be new parents plus keep the home fires burning, i.e. do lots of work on a range of other projects. 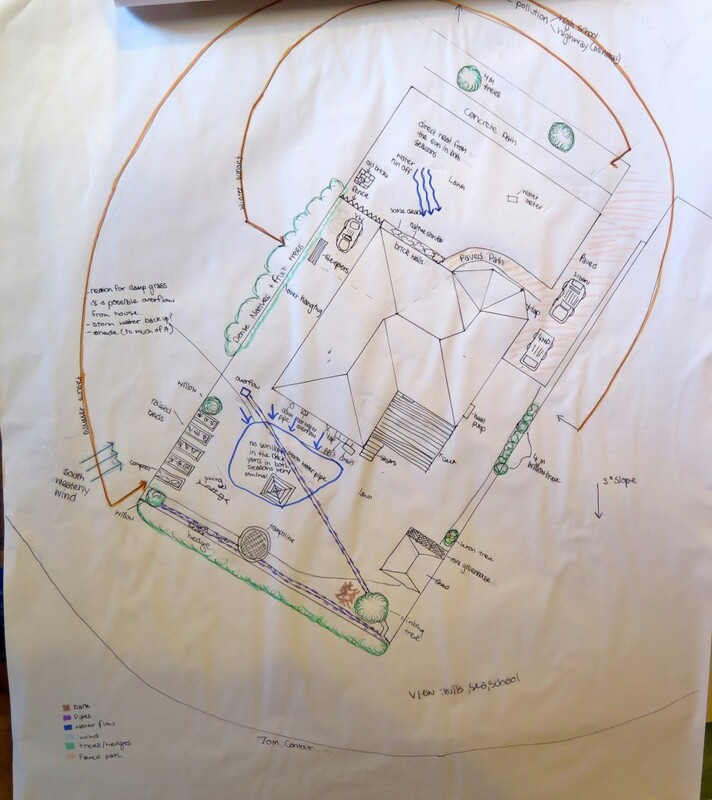 We’re really LOVING working with an ever expanding group of people on our courses and projects. It’s both great for us not trying to do everything ourselves and wonderful to learn from one another and build friendships and networks which we suspect will span our lifetime. Sometimes, amongst the slight chaos of pulling things together and our often messy kitchen we feel like we’re nailing it. Lately this feeling is inspired by collaborating with the fine folk you can see above (plus others). It’s so good to remember we’re part of something much bigger than ourselves and that by working together it’s only going to make big and good things more possible.